Polymer resin rotationally molded transitional round Madison vase planters. Strength and Beauty, interior or exterior, Armeria Madison vase containers can handle the most inclement weather conditions. Landscape architects, interior designers, contract landscapers, and interiorscapers have the capability to put the classic look of aesthetically appealing planters on rooftop decks, balconies, and other spots where weight is a consideration. 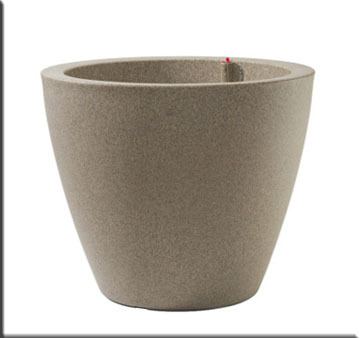 Madison polymer resin planters are available in 7 "Quick Ship" colors. Old Bronze, Caviar Black, Granite, Weathered Gray-Stone, Weathered Stone, Rust, and Weathered Terracotta ship within 48 hours. Along with 13 special order colors. 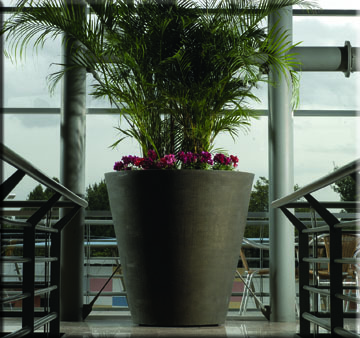 Rotationally molded Madison planters represent a viable lightweight alternative to traditional planters of clay, concrete or aggregate materials. 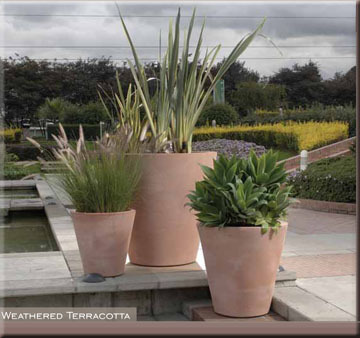 Plastic planters are up to 50% lighter than terracotta or concrete planters. Madison containers are manufactured with polymer type 2 resin and can be recycled. Madison rotationally molded containers provide a great value given their 10 year limited warranty. Please review manufacturers general terms and conditions of sale. Please note that the 48” planter is only available in stock in the Caviar Black, but can be special ordered in all our other finishes.